Giga-Bites Cafe is hosting a building/painting challenge for Age of Sigmar!! I was lucky enough to be selected to participate. We are randomly assigning factions, and I got the Ironjawz. I’m super excited about this because I’ve never played orcs/orks before, even though I’ve always liked them. Not only that, but the Ironjawz are some of the most beautiful models in the orc line (Age of Sigmar or 40k). I’m starting off with a Start Collecting! box of Ironjawz, which includes 1 Warchanter, 10 Ardboyz, and 3 Gore-gruntas. This will be a great foundation for a new army. In terms of expansion, I’m thinking of some brutes, more gore-gruntas (I love those models), and, of course, a Megaboss on Maw-Krusha. However, that’s going to be farther down the line. I have to pace myself, after all. In terms of painting, I’m definitely going to paint them as the Bloodtoofs tribe. After all... the red ones go fasta! Today, I’ve gotten my very first Ardboy built. He looks lonely (and angry). 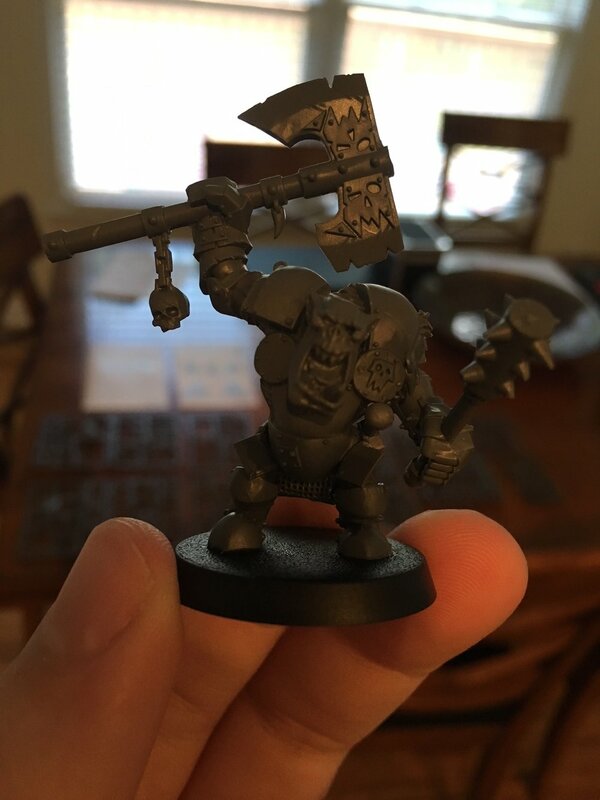 Time to get to work on getting him some friends to go to Waaagh! with. #Waaagh!